Stirling Single' 4-2-2 steam locomotive No.1, 1870. 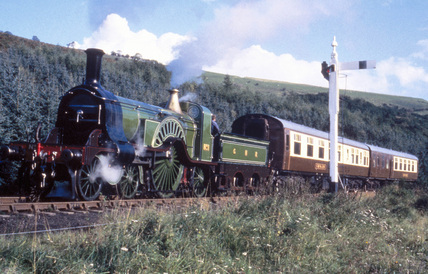 This locomotive was designed by Patrick Stirling for the Great Northern Railway and was built at Doncaster. It was withdrawn from service in 1907. It was a successful design and ran for 30 years. The driving wheels were eight foot in diameter, giving rise to their nickname '8-foot singles'. The locomotive and tender together weighed over 78 1/2 tons. Shown travelling on the North Yorkshire Moors Railway.